Titen developed a new high speed line of bearings which are made in the Swiss manufacturing process. 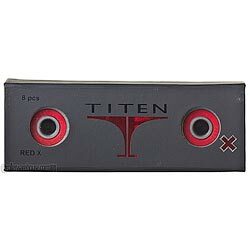 Titen's Red X are as fast as ABEC 9 bearings but maintain their speed over a longer period of time. Red X bearings come with oil lubrication for highest speeds and require cleaning and oiling if skating in dusty conditions. They come in different precision grades from ABEC 5 to 9. All bearings feature sealed metal shields which provide protection from wet and dusty conditions. The bearings come in an exclusive packaging with padded foam and magnetic closure. Titen changed the lubrication from oil to grease which significantly extends the lifetime of the bearings. Titen bearings are using Viscoseal grease which is specially developed for outdoor use. The grease is dispersed to the outside through the rotation of the bearings and seals off all cracks and openings. This effectively prevents dust and dirt from entering and results in a much longer lifetime and speed. Although initially slightly slower than oil we recommend it to most riders due to its maintenance free nature. I used them as my bearings all year last year (live in ohio so really about 7 months or so) and after 7 months of pretty extensive use, they held up great. I mainly do street skating and I side more on the recreational side of things, but on average I was putting 125-150 miles per month on my skates (track pretty much everywhere with my smartphone). These lasted the entire season, and actually a little bit into this season too. I didn't do anything overly special to maintain them either. Every time I changed my wheels out, I would simply flush the bearings with a silicon spray to clean them out and lubricate them, and then throw a little bit of dry graphite lubricant in too and they have lasted me an extremely long time.